We are the suppliers of Stomacher sterile lab blender for microbiological work and our model LM 40 has been supplied to various food labs with NABL accreditation in India. We supply stomacher bags also. 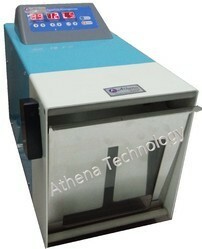 We are engaged in offering Stomacher Laboratory Blender. We are a top-notch organization, engaged in providing Stomacher Laboratory Blender. Innova Lab Instruments Pvt. Ltd.
Banking on our enriched industry experience, we are able to supply Stomacher Laboratory Blender. Sterile homogenizer is also called flapping homogenizer or stomacher blender, widely used in homogenization treatment for animal tissue, biological samples, etc. It plays an important part in food, medicine, cosmetics, clinical molecular, toxin and bacteria test, especially in microorganism testing sample preparation. 2.Intelligent program control, able to set the flapping time, speed, etc.